Louise Ferris from our team attended the event alongside Vanessa Thompson (DWP) and Alyson Jackson (HMPO) as a result of their nomination for a Civil Service award for their joint work on ‘A Whole New World’ – a cross departmental programme to help the long term unemployed, which they designed and delivered. The programme was piloted in Plymouth and as a result of its success in helping citizens into employment has been extended into other areas of the South West. Louise said what struck her was the diversity of the nominations, from initiatives to identify victims of modern day slavery to the introduction of robotics to support customer service. 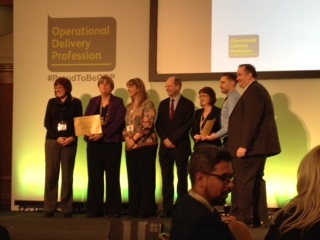 The trio were proud to be presented with a certificate in recognition of their achievements by Sir Philip Rutnam and incredibly Proud to be ODP.